Flaxseeds and chia seeds can both be nutritious additions to your diet. If you don't have one of these seeds handy, however, you can easily substitute the other in most recipes. They both have a gel-forming action due to the soluble fiber they contain and provide a similar amount of many nutrients. Chia seeds are a bit more expensive but easier to use since they can be stored at room temperature and don't require grinding before use. Ground flaxseeds and chia seeds can be used interchangeably as an egg replacement. Simply mix a teaspoon of ground chia seeds or 1.5 teaspoons to a tablespoon of whole chia seeds into 1/4 cup of water and let it sit for about 10 to 20 minutes to form a gel. This is faster than the 30 minutes it takes with flaxseeds, which require 1 tablespoon per egg being replaced, so chia is a better choice if you're in a hurry. If you don't like the grassy or nutty taste of flaxseeds in baked goods, substitute chia seeds instead for a more neutral flavor. Both flax and chia can be used in place of some of the flour in baked goods or as a binder or egg replacer in gluten-free or vegan recipes. 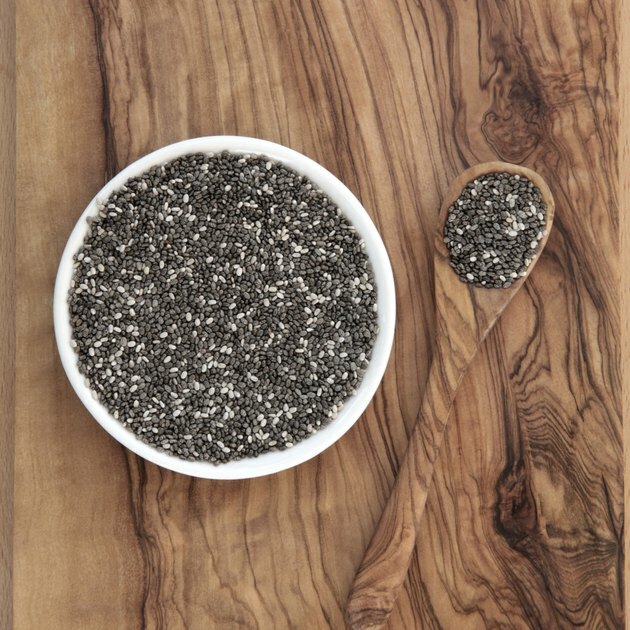 Choose whole chia seeds if you want a more crunchy texture or ground seeds for a smoother texture. Chia seeds can be handier than flaxseeds in other recipes as well because they don't need to be ground before use. Flaxseeds aren't well-absorbed if consumed whole. Use either type of seed interchangeably on a 1-to-1 basis in smoothies, soups, meat loaf, burgers, pancake or waffle batter or granola or sprinkled on top of yogurt, salads or hot cereal. Both flax and chia seeds are similar in nutrients, but chia seeds are a bit higher in fiber, with 5 grams compared to 3 grams in flaxseeds. A tablespoon of either has 4 to 4.5 grams of fat, 2,300 to 2,400 milligrams of omega-3 fat, 2 to 2.5 grams of protein and 55 to 60 calories. Flaxseeds provide lignans, a type of phytochemical that may help limit your risk of prostate or breast cancer, but chia seeds don't have this nutrient. Chia seeds, on the other hand, are better sources of magnesium and calcium. The Globe and Mail: The Super Seed Square-Off: Which Is Healthier?